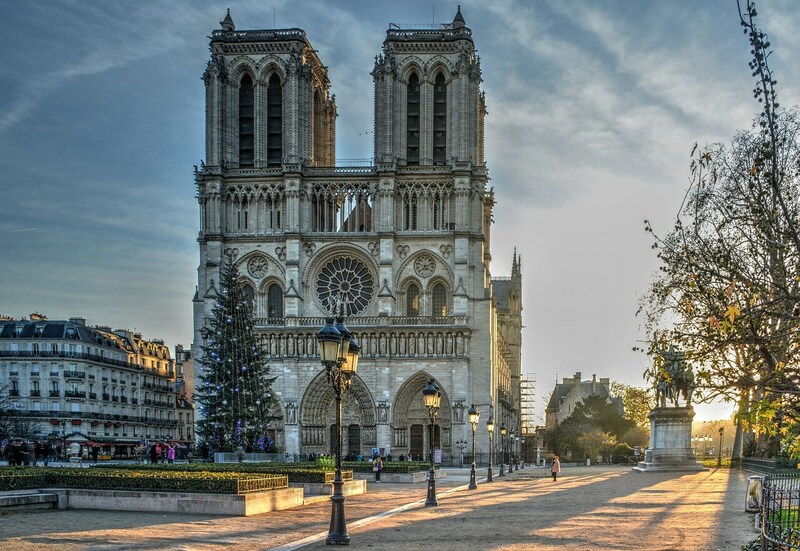 Considered to be one of the greatest examples of French Gothic architecture, Notre-Dame Cathedral (meaning Our Lady of Paris) is one of Paris's most famous landmarks. 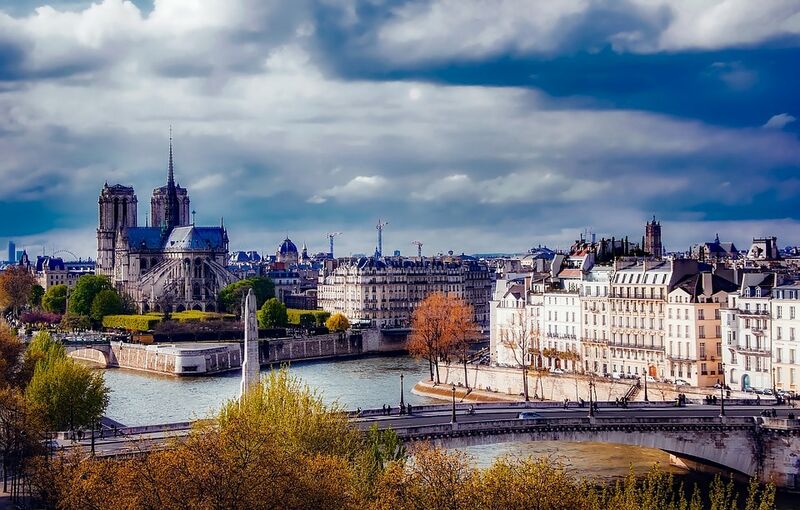 Located on the Ile de la Cite, an island in the river Seine, the cathedral was commissioned by Maurice de Sully shortly after becoming Bishop of Paris in 1160, and built over two centuries, from 1163 to 1345. 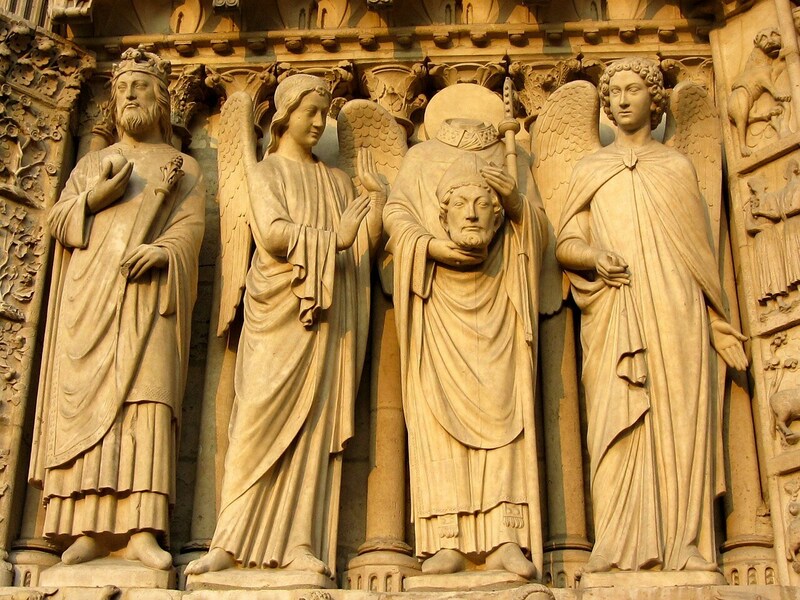 The cathedral is renowned for the naturalism of its gothic sculpture as well as its sublime stained glass art, typifying the improvements made over the previous era of Romanesque Architecture. 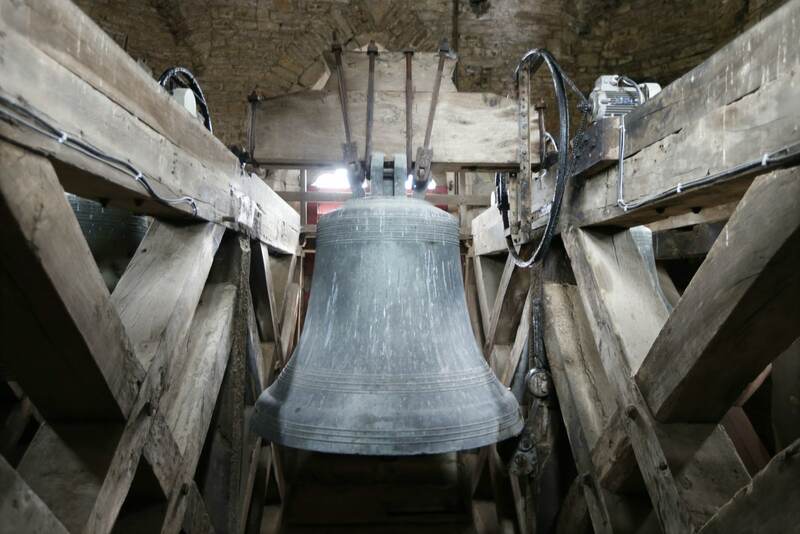 Significant damage was caused to the cathedral during the radical phase of the French Revolution (the 1790s), which was followed in the mid-1840s by an extensive program of renovation. 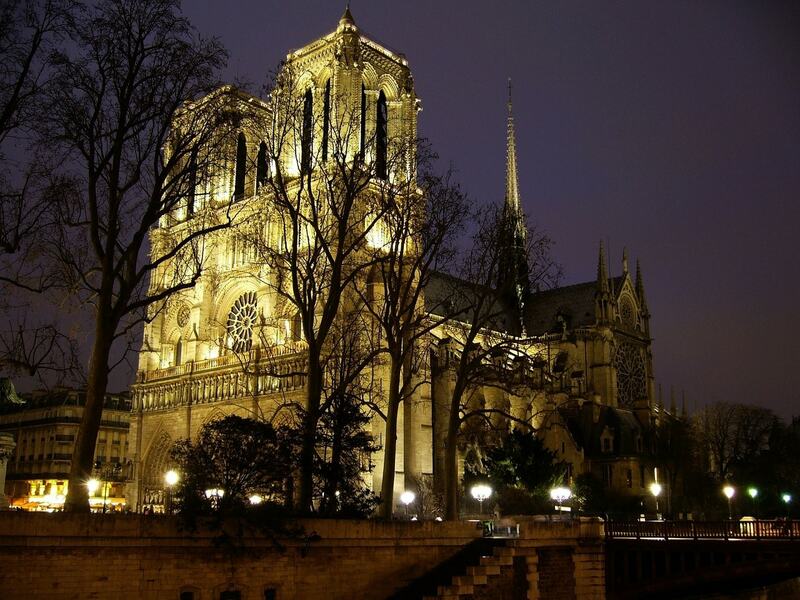 In 1991, Notre-Dame Cathedral was added to the UNESCO World Heritage List of culturally important sites. 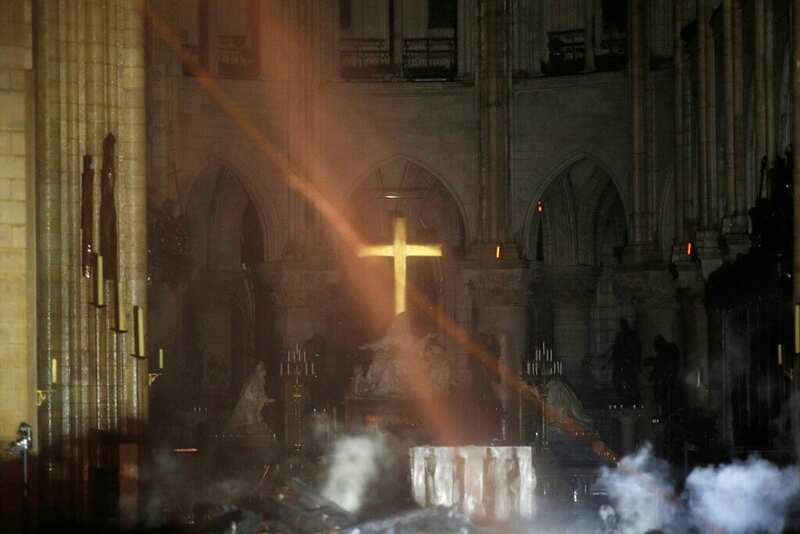 The Notre-Dame Cathedral is 865 years old as of date. 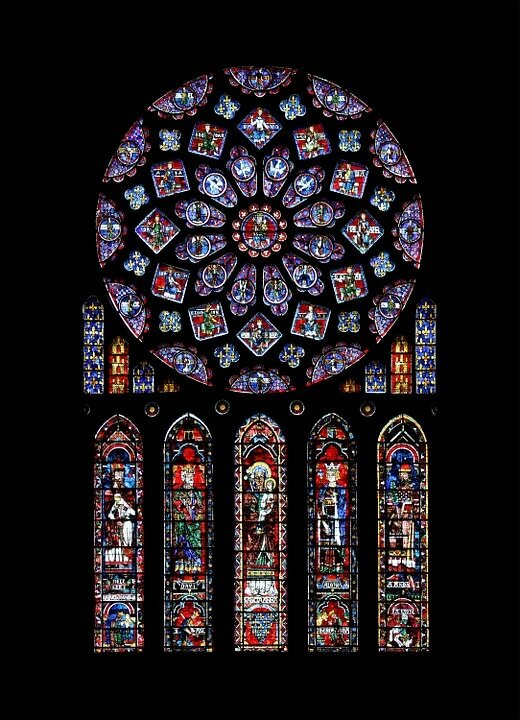 The north rose window of the Cathédrale Notre-Dame de Paris, an example of Rayonnant architecture, and the row of figures in stained glass below. Towers on the west facade (1220-1250). 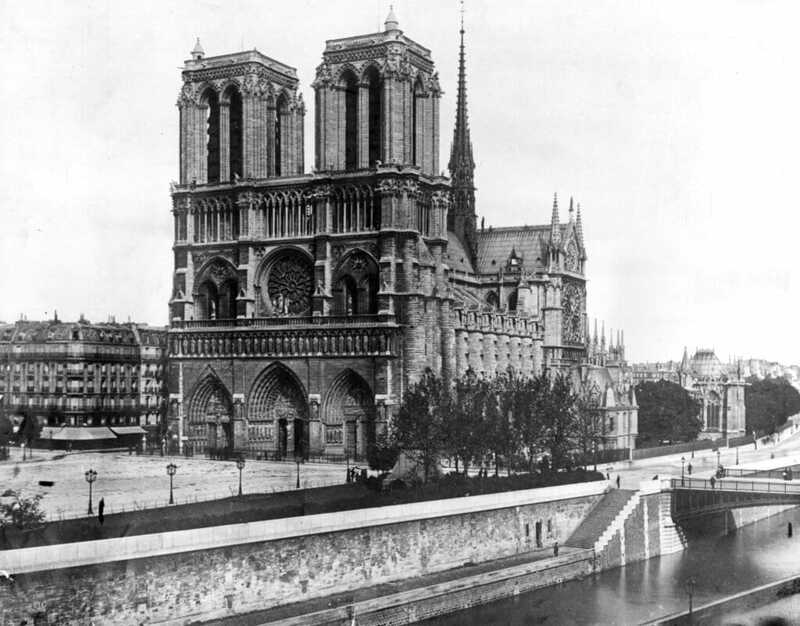 The north tower of Notre-Dame Cathedral (left) is slightly larger. 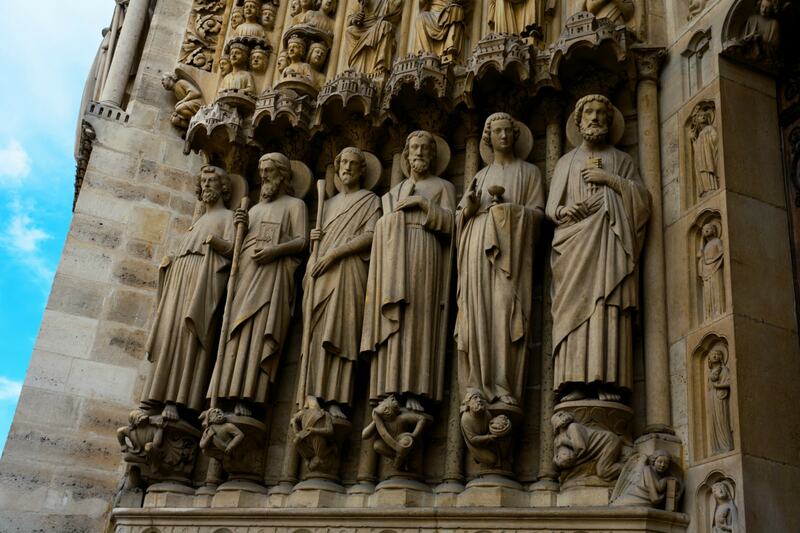 Saints in Portal, Notre-Dame Cathedral, Paris. 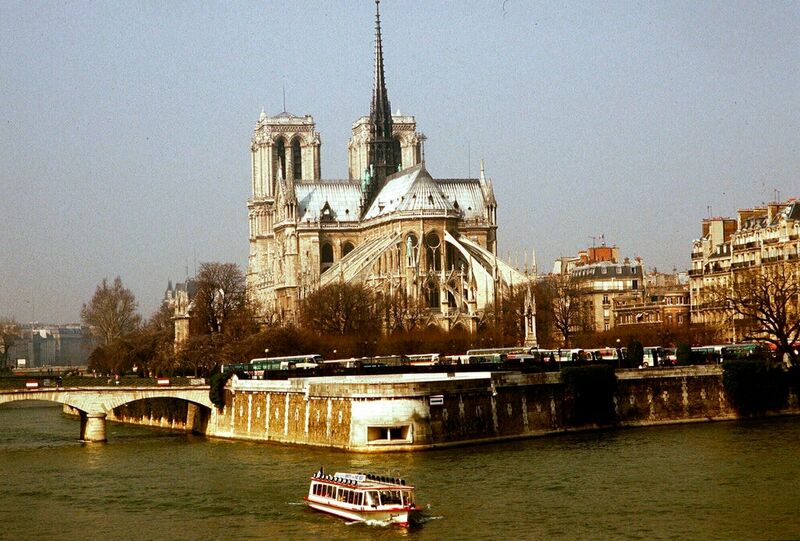 View of Notre-Dame Cathedral, Paris from the river Seine. 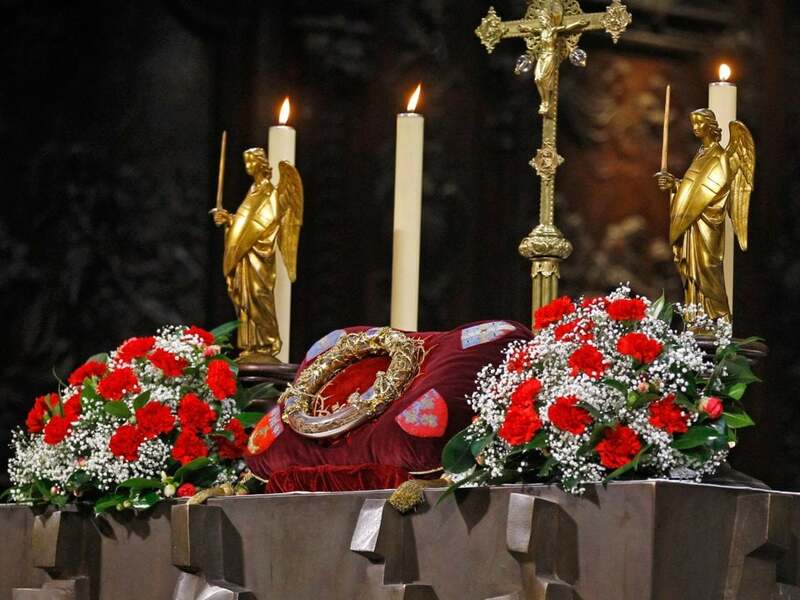 The martyr Saint-Denis, holding his head, over the Portal of the Virgin. A stryge on the west facade of the Notre-Dame Cathedral. 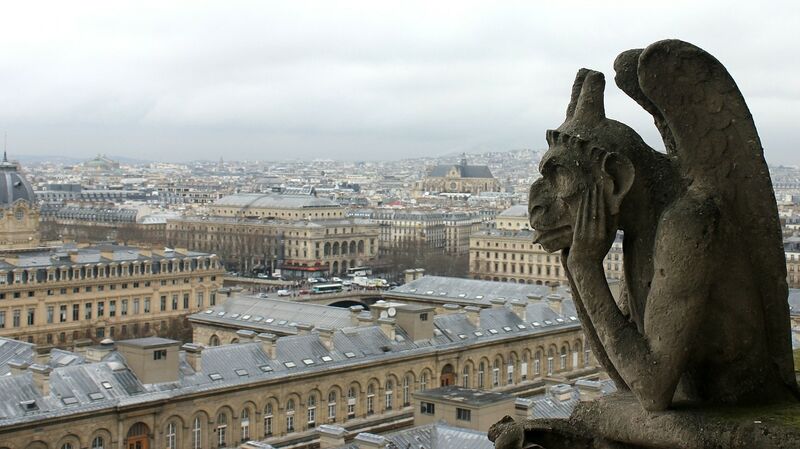 Gargoyles and stryges are commonly found on the Cathedral as part of the Gothic architecture. 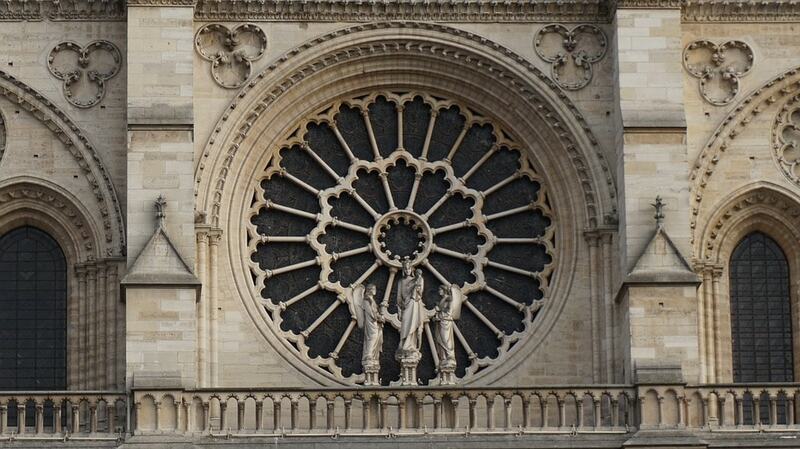 The earliest rose window, on the west facade (about 1225). 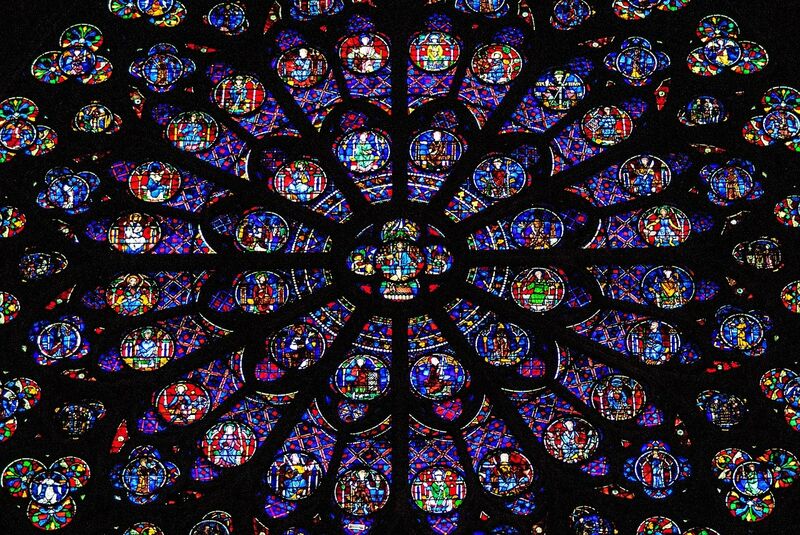 North rose window inside the Notre-Dame Cathedral (about 1250). 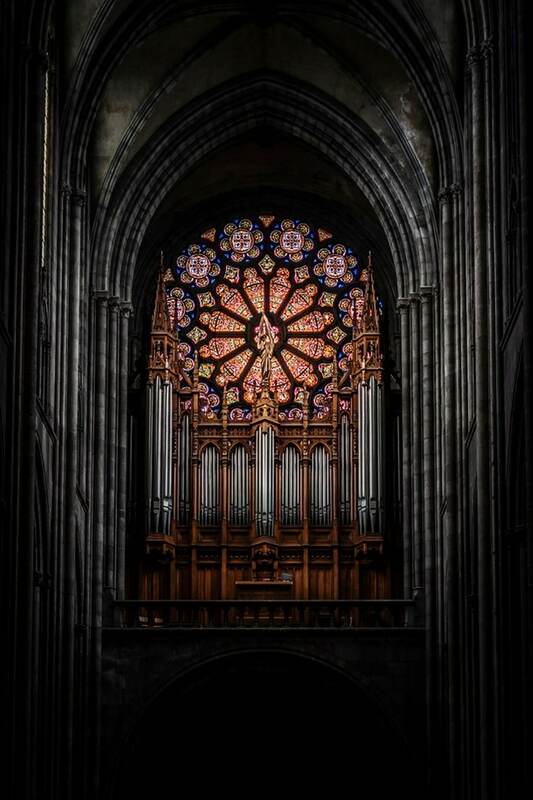 The famous organ of Notre-Dame de Paris. 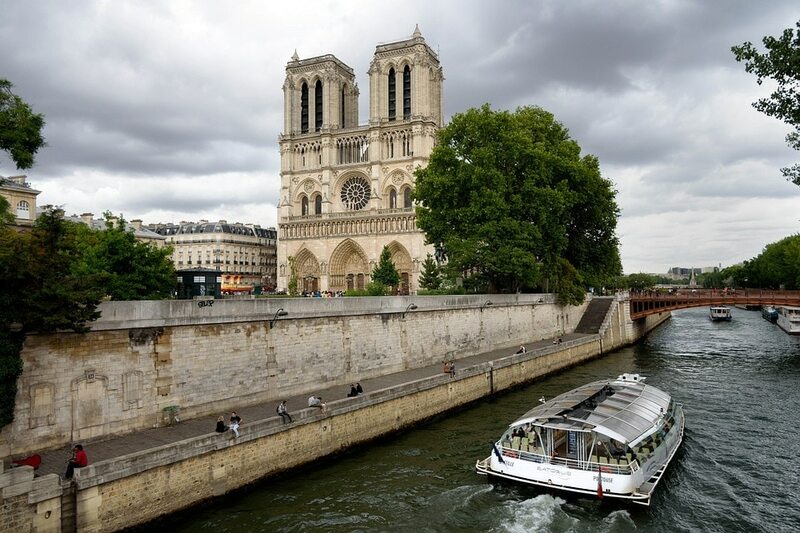 A wide angle view of Notre-Dame's western facade across the river Seine. 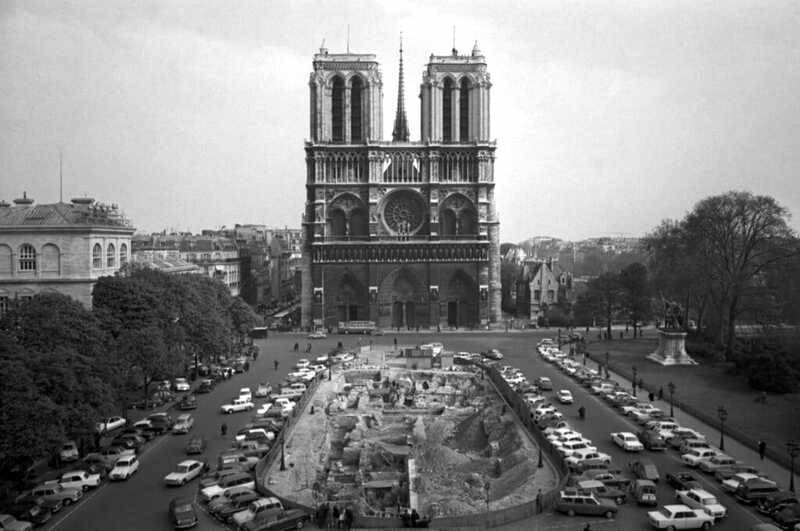 Flying buttresses of the apse of Notre-Dame (14th century) reached 15 meters from the wall to the counter-supports. 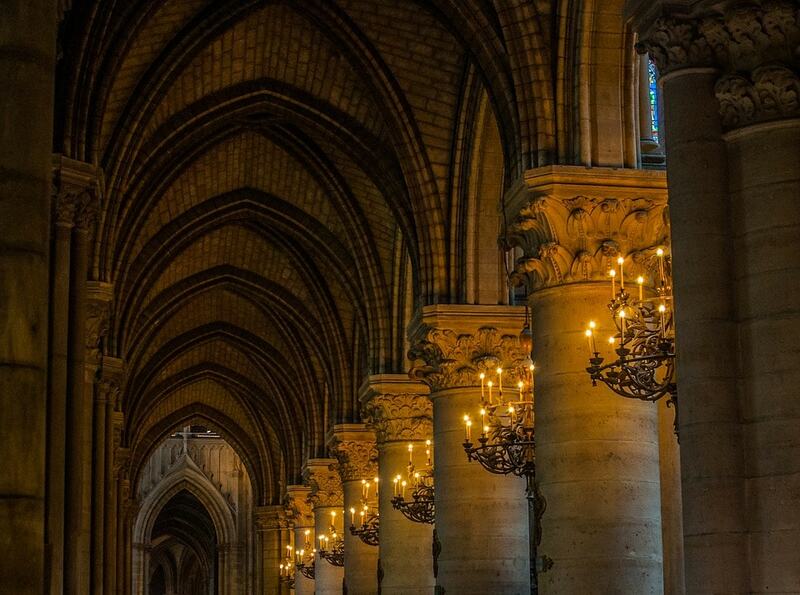 The elaborate hallways of Notre-Dame lighted with chandeliers. Notre-Dame at night, from a corner of the street. 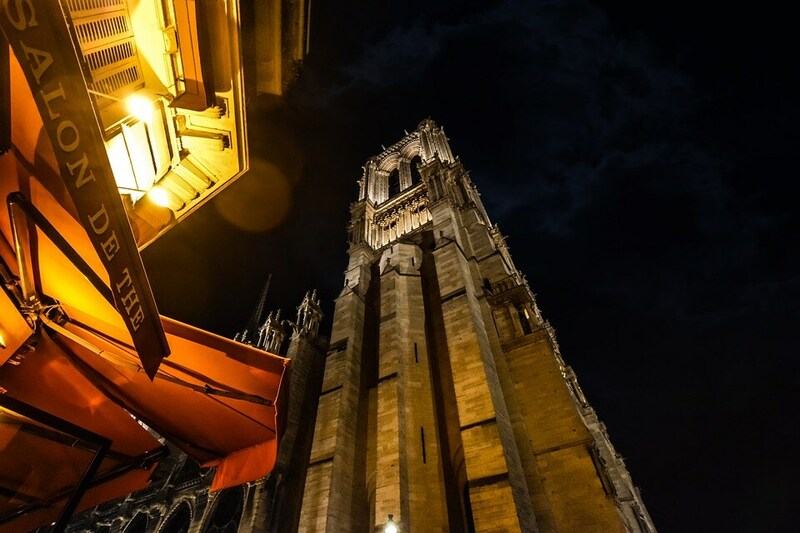 The 800-year old Gothic-styled Cathedral is now surrounded by shops outside. 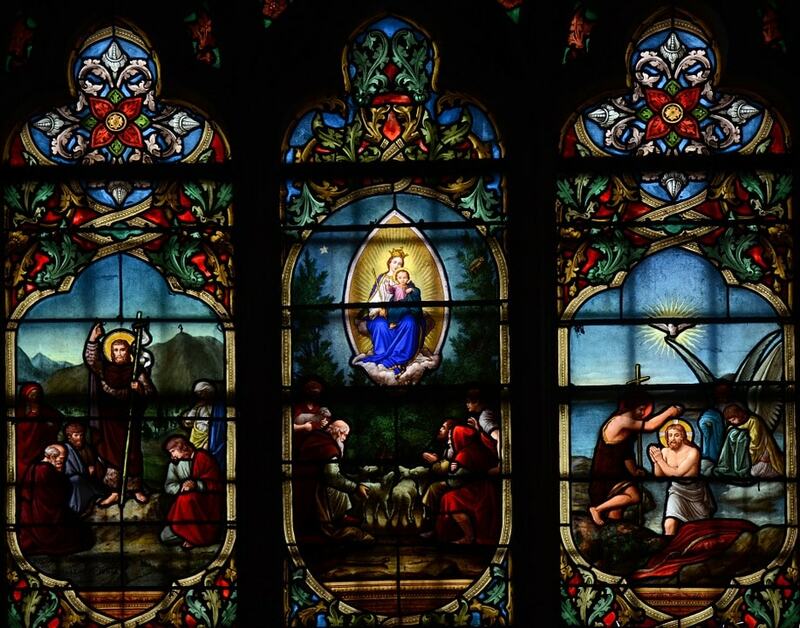 A glass painting depicting the life of Jesus Christ inside the Notre-Dame Cathedral, Paris. 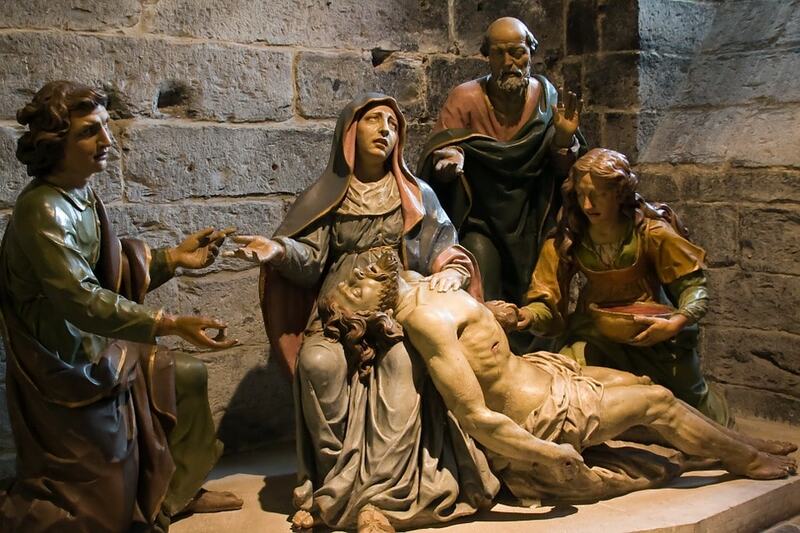 Statues inside Notre-Dame Cathedral depicts Mother Mary holding Jesus Christ after his crucifixion. 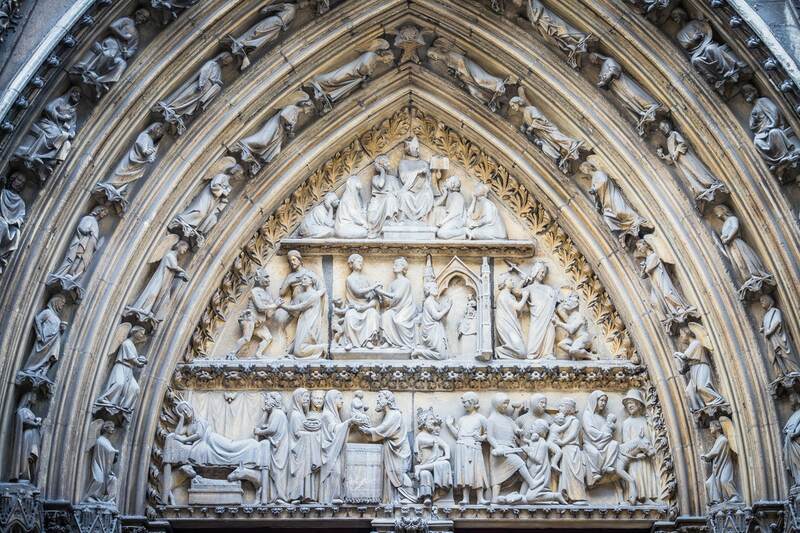 A facade over a door outside the Notre-Dame Cathedral, Paris.